Crepes are incredibly versatile, offer a variety of stuffing options, and are healthy, tasty, and filling. You can have them as a part of a delicious breakfast, a nutritious lunch, a delectable dinner, or even as a midday snack. 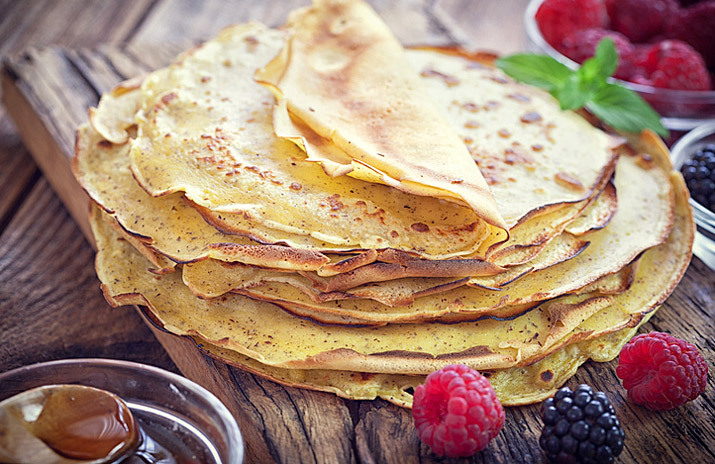 Here are some useful pointers to help you make mouth-watering crepes. It may seem like a great idea to quickly whip up the batter, pour it on to the pan to get thin crepes, and eat them immediately. However, it is advisable to prepare it in advance and allow it to rest at least for an hour. This will add to the flavour and give your crepes better texture and taste. If you feel like having crepes for breakfast, you can even prepare the batter the night before. To get the perfect paper-thin crepes that taste great, you must ensure that there are no lumps in the batter while making it. Use a strainer and a blender to mix the ingredients properly to get a smooth batter. One of the secrets to getting soft, perfect crepes is to get the consistency of the batter right. Make sure that your batter is ‘runny,’ unlike pancake batter which is supposed to be thick. You must pour an adequate quantity of batter on to the pan. If you use too little or too much of it, you will not get the desired quality. Ideally, one-fourth cup of batter makes one crepe. If you want to have a slightly larger one, pour one-third cup on the pan instead. It is essential to heat the pan adequately and get the temperature right. Start with medium heat and adjust accordingly. Remember, the first few crepes may take 1 to 1 1/2 more minutes to cook properly. Do not be in a hurry to flip them. You can rest assured that everything tastes great with crepes. Get creative with the fillings and use fruits, vegetables, syrups, jams, and more. There are no specific set of instructions, which is why you can put your creative skills to work and come up with new recipes each time. If you are making this iconic French food item for the first time, be patient because the best way to perfect crepes is practice. The key to crepes is size, temperature, and thickness of the batter. Once you have these down, you’ll be making perfect crepes in no time! At Crepe Delicious, we have a wide selection of sweet and savoury crepes. If you wish to have tasty, perfect crepes, visit a location near you, explore our menu, and discover your personal favourites. Be sure to check out our healthy breakfast crepes and special kid’s menu as well.